01-Mar-2019 -- I’m spending a few days on vacation in eastern Victoria and southern New South Wales, and (of course) will try to visit some Degree Confluence Points during my trip. My first visit was to this point, which - although very easy - had not been visited in the past 13+ years. 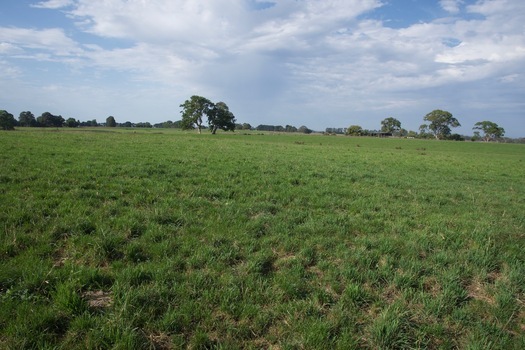 The point lies in farmland, just 100 m west of the paved Maffra-Sale Road, north of the town of Sale. Recent satellite imagery showed a distinctive circle in the area, indicating that the farm has been using central pivot irrigation. Sure enough, there was a large irrigation machine just to the northwest of the point. Unfortunately I wasn’t able to get a ‘drone’s eye’ view of the area, as it is in an aviation ’no fly’ zone (due to the presence of a nearby air force base).